According to IoT Analytics estimates, there are roughly 7 billion connected IoT devices at the end of 2018. Most of those devices are connected via short range protocols (WPAN or WLAN). The number of total connected IoT devices is expected to reach 22B by 2025, in part driven by new low-power wide-area (LPWAN) standards as well as 5G. Throughout 2018, the team of analysts at IoT Analytics revised the general mid-term forecast for IoT spending for the next 2 years from 36% to 39% annual growth . This revision came on the back of extremely strong business reports and outlook from leading IoT firms across the entire stack (semiconductor, connectivity, software, cloud). Cloud and platform firms were especially strong, with some reporting growth rates near 100% for their IoT business. The Google trend graph showed strong and steady interest for “IoT” in the public domain (see red line in the picture below). Going forward, the proliferation of new connectivity standards (mostly LPWAN, 5G), the maturation of technologies (platforms, edge, digital twins) and the increased focus on solving customer problems (vs. technical problems) will continue to drive the market. However, the recent global economic slowdown and international trade tensions are expected to somewhat dampen the bright and positive picture of IoT 2018. Since announcing the Azure IoT Suite in 2015, Microsoft has established itself as a major player in the IoT space with its Azure cloud offering and related IoT Platform-as-a-service. In April 2018, Microsoft doubled down and announced a further $5 billion investment into IoT technologies over 4 years. The majority of those investments are expected to flow into cloud services, IoT operating systems and analytics. After announcing services such as “Azure IoT edge” and “IoT central” in 2017, the two standout IoT services announced by Microsoft in 2018 were Azure Sphere and Azure Digital Twins. Azure Sphere is Microsoft’s highly secured end-to-end solution for connected microcontroller powered devices. Azure Digital Twins is a service that allows developers to build digital replicas of physical assets – an essential tool to scale analytics and other elements of an IoT solution across thousands of devices. Last year, IoT Analytics called out voice-enabled home gateways, like Amazon Echo, as the biggest consumer IoT success of 2017. In IoT 2018, another true success story made its debut on NASDAQ: Speaker manufacturer Sonos. Sonos went public on August 1, 2018, which was 14 years and $450M in funding after the Santa Barbara-based company first introduced their revolutionary wireless speakers at CES in 2004. Sonos was one of the first entrants in the smart speaker market, and it has created high-quality products that consumers love and that consistently receive great reviews. The company has sold 19 million products to date, and with more than 1 billion households in the world and the average household currently purchasing roughly 3 Sonos products at once, Sonos has yet to address more than 99% of the global market. The Sonos post-IPO share price, however, tells a different story. The stock has fallen roughly 40% (as of Dec 27, 2018) since its IPO in August 2018 over fears that the big smart home giants (Google, Amazon, or Apple) might eventually stop partnering with Sonos and instead take over the smart speaker market themselves. The other consumer IoT IPO of 2018, smart home camera manufacturer Arlo Technologies, had an even worse introduction to the public markets; the stock is down roughly 50% since the IPO. Both companies want to avoid becoming another Fitbit – one of the biggest failed IPOs in IoT history. The Fitbit stock is down more than 70% since its IPO in mid-2016 while the NASDAQ index is up >30+%. Industrial automation powerhouse Rockwell Automation in June announced a $1 billion equity investment in IoT Platform, PLM and CAD software leader PTC. The announcement was heavily discussed in the industrial IoT community as people had wondered how Rockwell would respond to the strong IoT Platform push of its main competitor, Siemens. Later in 2018, Rockwell showed how the company now relies on PTC to supply IoT Platform components as part of the newly announced “Innovation Suite powered by PTC”. Both companies aim to further build out their software components into an integrated industrial digitalization solution. One of the 10 IoT Analytics predictions for 2018 was that China would become a leading IoT adopter, and China has indeed made headlines in many ways throughout 2018. Perhaps one of the clearest signs of the power that China wields can be inferred from the failed Qualcomm-NXP merger. In October 2016, US-based chipmaker Qualcomm announced it would buy the leader in connected car chips NXP for $44B, making it the biggest-ever deal in the semiconductor industry. However, that merger never happened. The reason: China. The takeover had been approved in eight jurisdictions, including the European Union and South Korea – but as the global trade dispute between the US and China heated up in 2018, the Chinese regulator did not approve of the deal. There were several other global disputes with Chinese IoT companies. Most notably several countries and telecommunications firms banned Huawei and ZTE out of fear of being spied upon. At the same time, many companies looked to further strengthen their ties with China. Intel, Siemens, Renesas and myDevices, for example, all partnered with Alibaba Cloud to bring their products to China and work on joint innovation projects. Microsoft also expanded its Chinese cloud infrastructure, doubling the number of local Azure regions. Funding of Chinese IoT startups also increased significantly (see #10 “Largest startup funding” below). On July 30, 2018, the Wall Street Journal reported that General Electric, the pioneer of the “Industrial Internet” was looking to sell GE Digital and with it its IoT Platform Predix. The news came on the back of a series of negative events that had rattled the company in the preceding months. This included the layoff of thousands of workers, financial troubles of its subsidiary GE Capital as well as its shares being dropped from the Dow Jones industrial average. Just two years earlier, the company had announced ambitious plans to become “a $15B software business by 2020”, including $4B in sales from Predix alone. In December 2018, GE management finally decided on a different approach. The company sold its majority stake in the field services management software ServiceMax but decided to give GE Digital (and with it Predix) a fresh new start by spinning it out as a new separate entity. 2019 will give us more insight into the details of this new entity and whether it can separate itself from some of the negative coverage that GE has received over the past few years. Bain provided additional insights in a follow-up webinar in which it was shown that especially industrial customers are much clearer about ROI from IoT initiatives compared to 2016 and that “Quality Control” was marked both by customers and vendors as one of their key use cases. After several failed attempts to introduce an IoT cybersecurity bill to the US senate, California jumped ahead in late August 2018 and became the first state to pass an IoT cybersecurity law. Starting on January 1st, 2020, any manufacturer of a device that connects “directly or indirectly” to the internet must equip it with “reasonable” security features, designed to prevent unauthorized access, modification, or information disclosure. 5G was one of the most discussed tech trends of 2018 as it promises a step change in speed and latency. 2018 was also the year that the first 5G networks were switched on. June 2018 marked the preliminary (“early drop”) completion of the 5G standard, although some functional revisions are still expected until March 2019 or even later. In October 2018, Verizon Communications became the first operator in the world to officially launch a 5G network in 4 US cities (Los Angeles, Houston, Indianapolis, Sacramento). Verizon now claims to be “first in 5G”, although it has been criticized by its competition for basing their network on a proprietary 5G TF standard and not on the official 5G standard (as standardized by 3GPP). In December 2018, three Korean operators simultaneously switched on their commercial 5G networks. Unlike Verizon’s 5G network, their networks seem to be based on the 3GPP standard and also offer Fixed Wireless Access services (to enterprise customers). IoT 2018 saw one IoT-related mega-deal. In November, IBM announced its intention to purchase Red Hat in a deal valued at $34B – the largest software deal ever, according to some sources. The deal promises IBM to gain a better position in the cloud market in which its competitors AWS, Microsoft and Google have been edging ahead. With Red Hat, IBM now has its own container-solution, a strong cloud software stack and the ability to play much better in hybrid cloud setups, allowing to transfer data across multiple cloud environments. IoT Analytics expects that hybrid and multi-cloud setups will play an increasingly important role for IoT data storage in the coming years. The largest startup funding in IoT 2018 may be a surprise to many. For the first time, a startup that neither builds IoT infrastructure/backend services nor has a prime focus on consumer markets, topped the list of most funded startups. View, a US-based company that builds IoT-based building windows received $1.1B in Series H funding in November 2018. The technology allows the owner of a building to adjust how much light and glare a window lets in. The massive funding round was led by the Softbank Vision Fund, an investment vehicle that received a lot of media coverage in 2018 due to its $45B backing by Saudi Arabian money. Besides the aforementioned trend towards increased funding of IoT-based end-user applications, a second trend is the sudden increase in IoT-based funding rounds in China. China witnessed several Series A/B funding rounds with a total volume of approximately $100M – rather high numbers considering the early stage of the funded ventures. 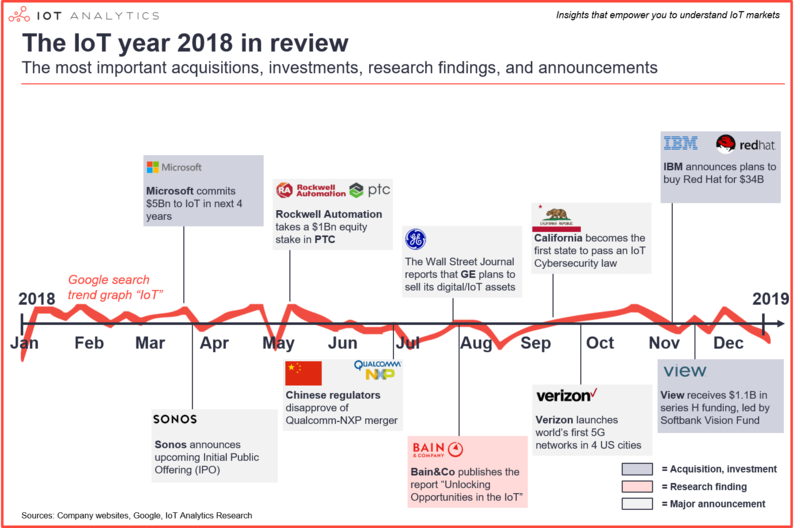 For a deeper look at current trends in IoT markets, check out our semi-annual “State of the IoT” market update (note: this is Enterprise subscription-only content). If you like what you read, subscribe to our newsletter for continued coverage and updates (such as this one). In 2019, we will keep our focus on important IoT topics such as IoT Platforms, 5G, LPWA, Industry 4.0, and blockchain with plenty of new reports due in the first half of the year. For complete enterprise IoT coverage (Enterprise subscription) with access to all of IoT Analytics’ paid content & reports including dedicated analyst time, contact us now and tell us what you are specifically interested in. The IoT Analytics team wishes you much success for 2019! 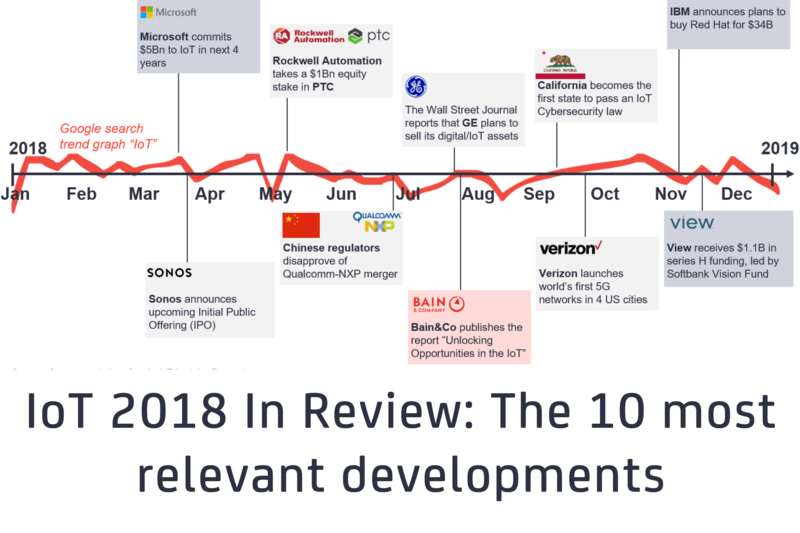 The post IoT 2018 in Review: The 10 Most Relevant IoT Developments of the Year appeared first on IoT Analytics.